School Performance | Read Academy var admin_url = "http://www.readacademy.co.uk/wp-admin/"
Read Academy’s first set of pupils took their KS2 SATs in May 2016. Alhamdulillah the results are really something to celebrate. 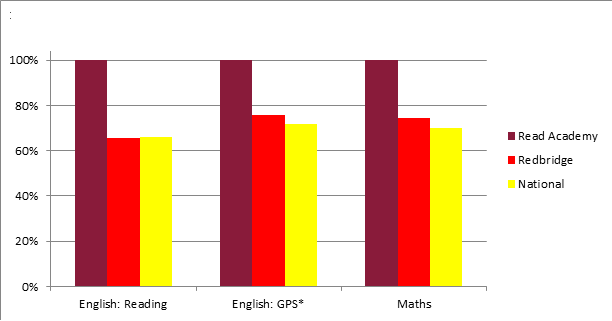 Pupils took SATs tests in Reading, English: GPS (grammar, punctuation and Spelling) and Maths. These tests were the first ones to reflect the new primary curriculum introduced in 2014. The new standard is much higher than the old one and nationally fewer children have met the new standard than the previous one. However, with the blessings of Allah subhaanahu wa ta’ala and the hard work of pupils and equally hard work and dedication of teachers at Read Academy, as you can see below, in the academic year 2015-2016 100% of pupils at Read Academy achieved working at the expected standard or above. Our pupils have performed exceptionally well Mashaa’Allah and received this achievement despite the changes to the curriculum and assessment being ramped up.